The layout above shows the icicle made from a long piece of stripboard with six high high efficiency white LEDs. There is also a 100&ohm; resistor, a 1N4148 diode and a 100µF capacitor to provide a step-up voltage converter to provide enough voltage for the LEDs. See Arduino White LED Driver - Voltage Multiplier. 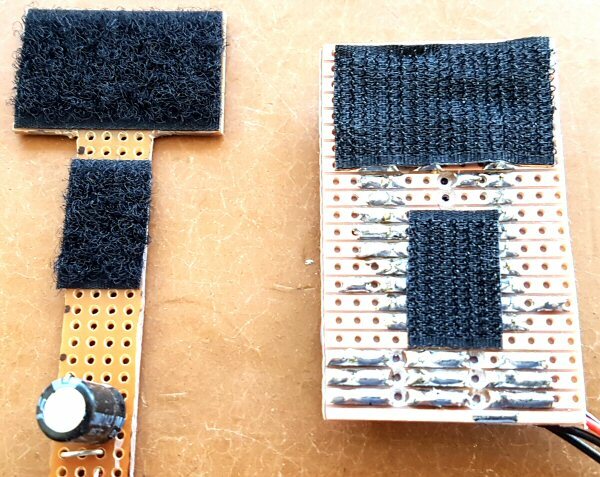 The Pro-Mini carrier board is fixed to the topside of the board on the right hand side with a piece of adhesive Velcro. The button battery board is fixed to the underside with Velcro too.